Who Needs Paint? Metallic Wallpaper Can Transform Any Space from Dull to Luxurious. Wallpaper is back and better than ever! Today, there are graphic and bold designs appealing to a wide variety of styles and tastes. When eye-catching metallic prints are added to the design, the reflected light adds a luxurious sheen to any space or wall. Think of wallpaper as artwork for your wall. 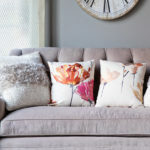 You can transform an entire room or add a stylish look to a single wall. 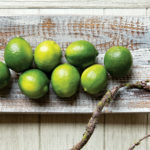 It can be used behind bookshelves or in small areas of the home to add visual pops to small, neutral spaces. 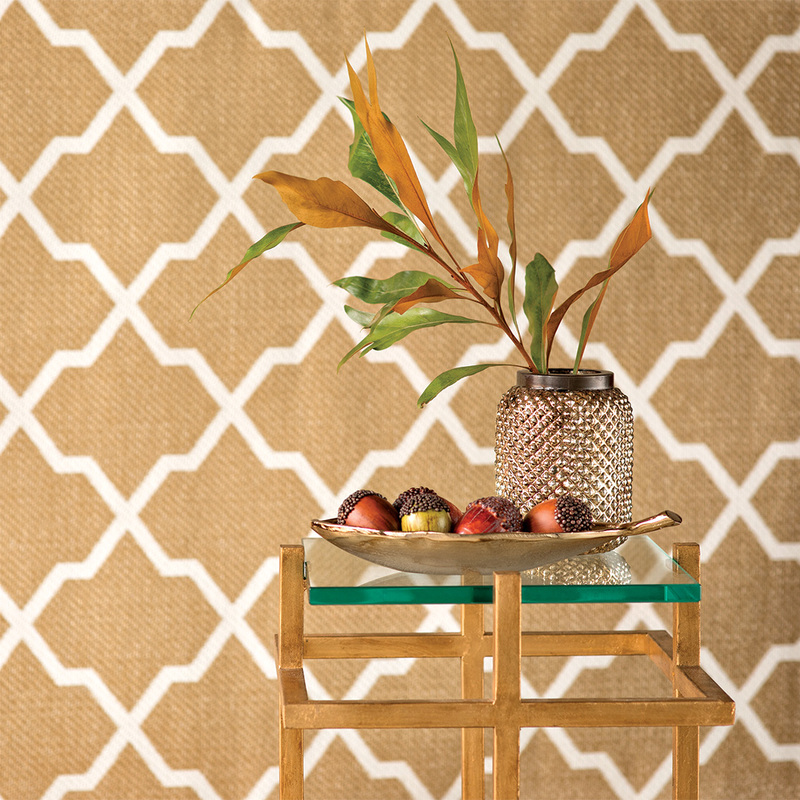 The new geometric designs are NOT your grandmother’s wallpaper. Add a cool, vintage vibe or a futuristic twist to a room or small nook in the house. Think minimalism means boring? Not with metallic prints, which can be simple, yet reflective of the play of light. Plus, with all the creative options available, it’s easier than ever to decorate with wallpaper that accentuates your own signature style. Right: A tasteful wishbone table and mortar and pestle from Les Fleurs accentuate the avian and floral patterns of this wallpaper, available at Andover’s Acorn Home & Design Center. The layers of overlapping silver and bronze hues create an effect that is simple yet never dull. 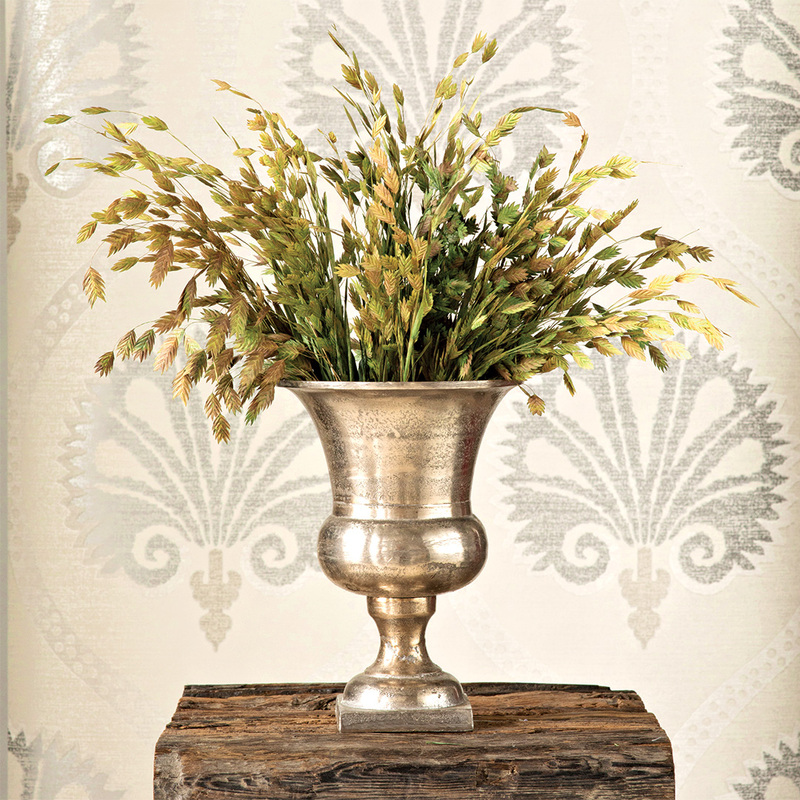 An Acorn side table and Les Fleurs black nickel vase reflect the luster of silver patterned wallpaper. 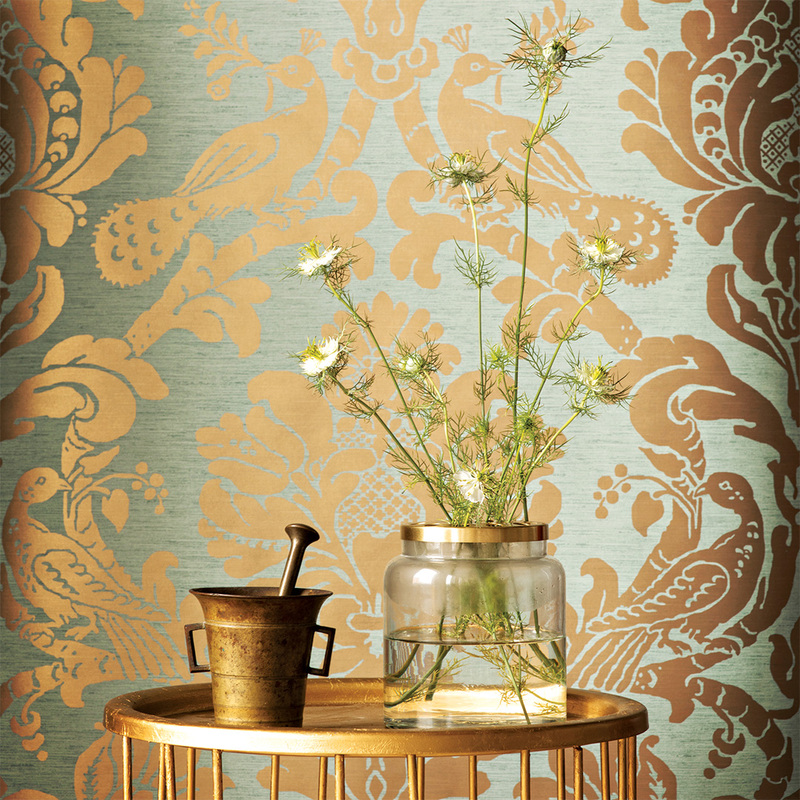 This gold wallpaper is foregrounded with a Les Fleurs copper vase. 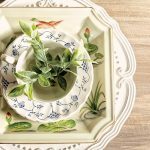 The acorn and leaf dish and side table are from Acorn Home & Design Center. 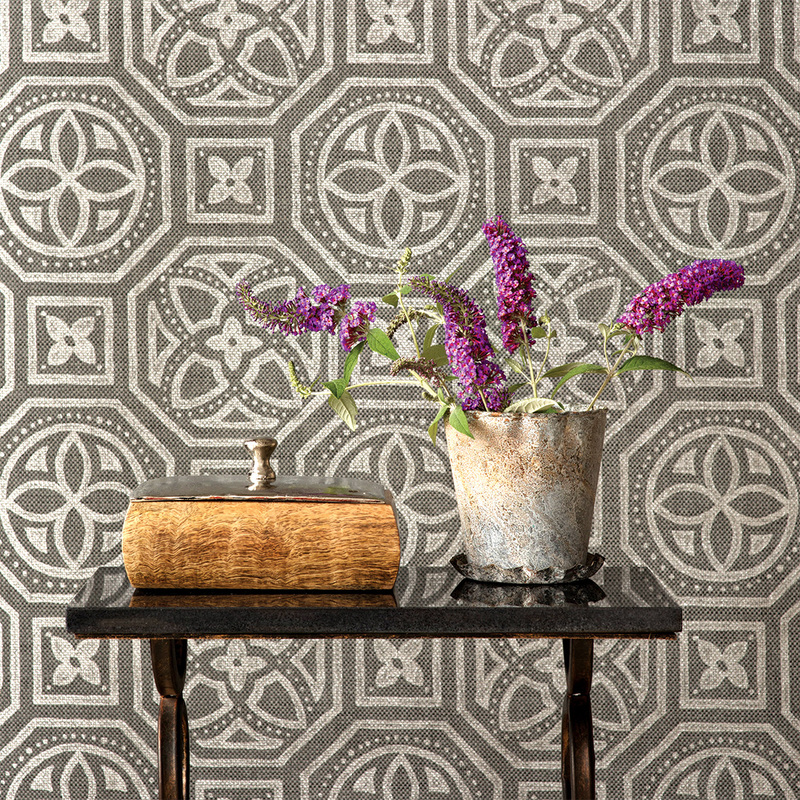 Foregrounded by a table, metal pot and saucer from Les Fleurs, along with a wooden box from Acorn, the symmetry of this wallpaper evokes a feeling of antiquity and the future. 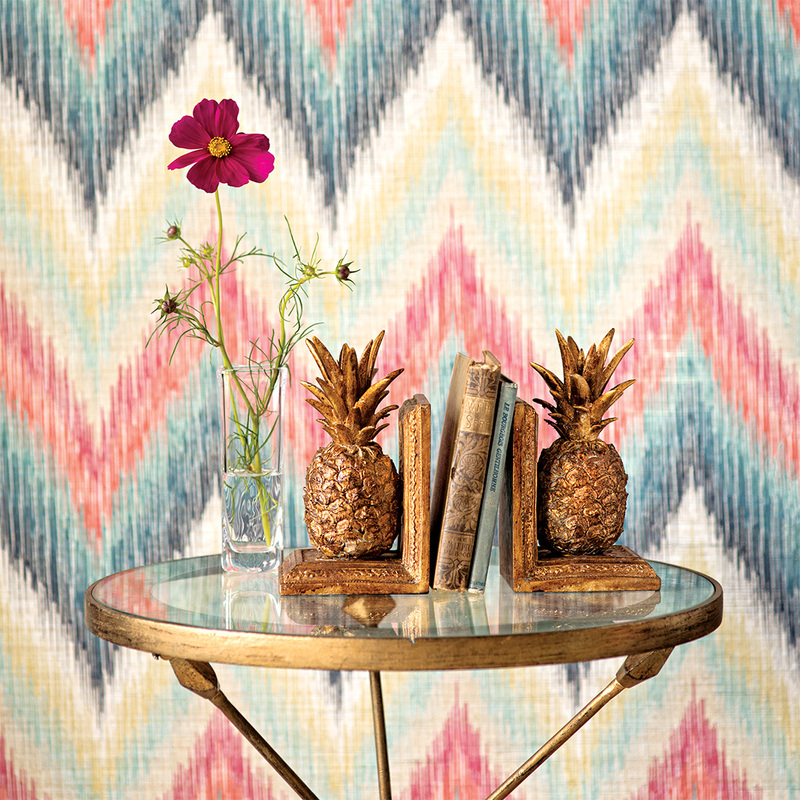 With an eruption of color in the background, this wallpaper’s angular pattern matches the spiky irregularity of Les Fleurs’ pineapple bookends. The Simon and Pierce Woodbury vase from Rose & Dove delivers the final touch — a strikingly simple and bold floral arrangement from a nearly invisible source. The arrow table is from Acorn Home & Design Center. Lysa Pelletier of Team Artist Representative – Boston, Mass. photography Emily O’Brien – Boston, Mass. 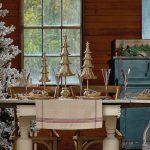 Acorn Home & Design Center – Andover, Mass. Les Fleurs – Andover, Mass. Rose & Dove Specialty Gift Shop – North Andover, Mass.